FUEL EFFICIENT 29 MPG Hwy/21 MPG City! Jeep Certified, CARFAX 1-Owner, ONLY 6,714 Miles! Heated Leather Seats, Onboard Communications System, iPod/MP3 Input, Satellite Radio, Smart Device Integration, Dual Zone A/C, Alloy Wheels AND MORE! Leather Seats, Back-Up Camera, Satellite Radio, iPod/MP3 Input, Onboard Communications System, Aluminum Wheels, Remote Engine Start, Dual Zone A/C, Smart Device Integration, WiFi Hotspot, Heated Leather Seats. Rear Spoiler, MP3 Player, Privacy Glass, Keyless Entry, Steering Wheel Controls. ENGINE: 3.2L V6 24V VVT Pentastar, Stop-Start Multiple VSM System, 3.25 Axle Ratio, 50 State Emissions, Anti-Lock 4-Wheel-Disc Brakes, Dual Bright Exhaust Tips, 3 Additional Gallons Of Gas, GVWR: 5,500 lbs, LUXURY GROUP Ventilated Front Seats, Bi-Xenon HID Headlamps, Exterior Mirrors w/Memory, Power Liftgate, Radio/Driver Seat/Exterior Mirrors Memory, TRAILER TOW GROUP 7 & 4 Pin Wiring Harness, Trailer Tow Wiring Harness, Class III Receiver Hitch, Full Size Spare Tire, TRANSMISSION: 9-SPEED 948TE AUTOMATIC (STD). Jeep Limited with Deep Cherry Red Crystal Pearl Coat exterior and Black interior features a V6 Cylinder Engine with 271 HP at 6500 RPM*. "The Cherokee is exceptionally quiet at highway speeds. 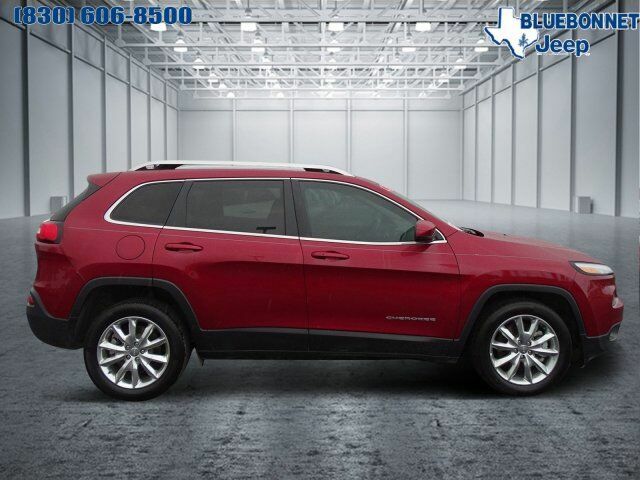 And over rough city streets, the Cherokee offers about as cushy a ride as you'll get in this class." -Edmunds.com. Great Gas Mileage: 29 MPG Hwy.